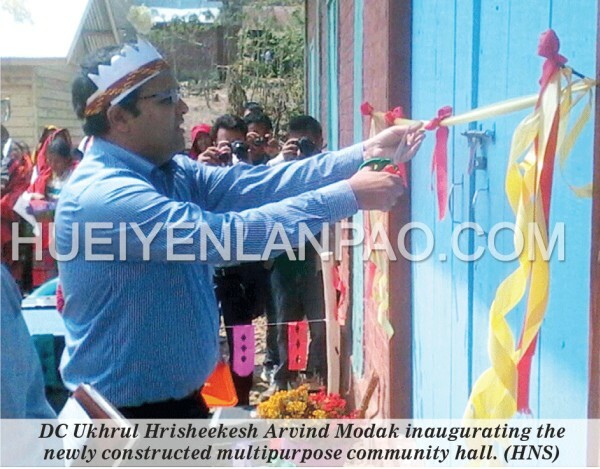 Ukhrul, March 23 2015: Deputy Commissioner (DC), Ukhrul Hrisheekesh Arvind Modak Monday inaugurated a newly constructed multipurpose community hall under the Common Facility Centre (CFC) initiative of IFAD Ukhrul in a function held at Langdang village in Ukhrul District. Located some 12 km North of Ukhrul District Headquarters, Langdang village having a total of 243 households, is one of the beneficiary villages of various rural developmental programmes taken up by IFAD Ukhrul in the district. Construction of the new CFC hall at a total cost of Rs.14, 95, 000 by Hotnangai NaRM-G, Langdang village with the project contribution of Rs.8, 73, 600 by NERCOMP-IFAD, Ukhrul is one among the agency's initiatives. DC Modak, who is also the chairman of NERCOMP Ukhrul, dedicated the new facility for the benefits of the villagers in the presence of project manager UDCRMS/NERCOMP-IFAD Tychicus Vashum at 11 am today. Speaking as the Chief Guest during the function, Modak called upon the residents to put the new hall to good use, while exuding hope that the spacious hall would cater to the varied needs of the villagers for holding meetings, Anganwadi and other local purposes. He also said that Langdang village has potential for growing owing to its proximity to the district headquarters. He then suggested that people could get engrossed in agriculture and related activities to enrich themselves economically. In his speech, project manager Vashum highlighted the importance of convergence in implementation of various developmental programmes in the present day context, while urging the district administration to explore such avenues. He said that the new CFC has been constructed as part of the IFAD's mission to create infrastructures in the district's rural areas. Comparing the construction of the same facility at different villages within the district, he felt that there were certain qualitative differences between them. He then made no bones of the fact that IFAD would not put up with any development partners which compromise on quality in execution of projects. During the function, Tangkhul cultural show and dance were presented by Langdang elders and youth. Representatives from various other fraternal NGOs were also present at the inauguration function. JSSK benefits denied at JNIMS?